Use the 2026-2045 quicklinks below to jump to an item of interest or simply browse down the page. This timeline of predicted inventions, adaptations, developments and discoveries offers a briefing that includes major statements made in 2006 or earlier by futurists, technologists, scientists and other experts. These experts see the items on this list as highly likely changes to come over the next 150 years. Those listings that are not attributed to one or two specific individuals are developments that are commonly accepted by many experts as proven to be likely, and they are being brought to reality by a number of innovators at many locations around the world. As technology accelerates, space travel is expected to become as prevalent and easy as people expected it to be by now. In the 1930s, some people expected humans would have accomplished intergalactic travel by the year 2006. While that was not the case, it is expected that by 2035 it will be possible for astronauts to travel extremely far distances to visit other planets without aging. If teleportation has not yet been accomplished at this point, humans will enter into a state of hibernation for long journeys. The body's metabolism will be slowed to prevent aging on trips that last several decades. The astronauts or travelers will sleep the entire trip while being connected to drips that will provide them with nutrients and vitamins necessary to live. The Singularity is a phrase that describes a time at which the simultaneous acceleration of nanotechnology, robotics and genetics change our environment beyond the ability of humans to comprehend or predict. At this point, new realities will prevail and there will be a new norm. Scientists, including National Technology Medal winner Ray Kurzweil (author of "The Singularity is Near") say economic, social and political structures will completely change - possibly overnight. Vernor Vinge, a scientist and teacher, says The Singularity could arrive as instantly as an earthquake and completely change all terrain as we know it. "When greater-than-human intelligence drives progress," Vinge writes, "that progress will be much more rapid." This accelerating loop of self-improving intelligence could cause a large jump in progress in a very brief period of time - this is being called a "hard takeoff" by people interested in this theory of development. Kurzweil sees a more gradual acceleration - a "soft takeoff" - one in which humans work to also extend their intellectual capacity to keep up with artificially intelligent entities. 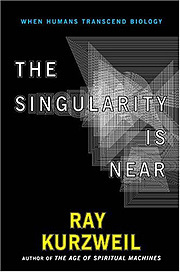 Still, he predicts that The Singularity could come as soon as 2045. The Singularity presents the idea that biological life may eventually be replaced by self-engineering, self-replicating intelligences. Some people posit the extreme, "grey goo" scenario, in which nanotechnology - not the sleek, humanoid robots seen in popular films, but a mass of gunk - displaces humans. Some researchers say that matter could be engineered to embody vast computational capacities - that entire planets or stars may be converted to what is sometimes called "computronium," a form of matter that is an intelligence. Planning has already begun for a carbon nanotube cable to run from one or more floating ocean platforms to one or more satellites, connecting Earth to space. Cargo and passengers will be sent up and down the cable as on a really, really tall elevator. The orbiting station to which each cable connects can be used as a launching area for further space exploration, a space-based observation post and a facility for accomplishing experiments and manufacturing efforts that are best completed in zero gravity. A village on the moon will also be established.